Forty-seven-year-old Zhen Zhen attempted to kill her lover, Leo Feng, 41, when she set Ernest Hotel in the Ikeja area of Lagos on fire. The hotel attendant, Emeka Nwaegbo, said this at the resumed hearing of the case at the Ebute-Meta Magistrate’s court. 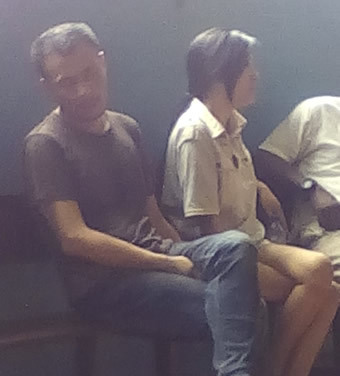 Nwaegbo told the court that Zhen accused Feng of sleeping with her without giving her food, which informed her decision. It was alleged that the couple smoked and shunned the warning of the hotel attendant to stop the act. The lovers checked into the hotel on Allen Avenue, Ikeja, on July 4. However, around 2am on July 5, the hotel was said to have been gutted by fire. The couple were arrested by the police and the case transferred to the State Criminal Investigation and Intelligence Department, Yaba. Although the couple were arraigned last Wednesday on counts of arson, the magistrate adjourned till Friday to enable all witnesses to be present in court. PUNCH Metro gathered that the suspects, who could not meet their N2m bail conditions, were remanded in prison. Present at the resumed hearing were the manager of the hotel, Ernest Nwayerem; the hotel attendant, Nwaegbo; and the representative of the Chinese Embassy, who identified himself only as Olayiwola. Nwaegbo told the court that the lovers were customers at the hotel, adding that Feng, who was indebted to the hotel, dropped his personal effects, including passport, to assure the management that he would pay his outstanding debts. He said, “At about 10.30pm, they both checked into the hotel. The man dropped his belt, money, passport and socks with the receptionist downstairs because they owed the hotel some money. “I was conducting a routine check round the hotel when I discovered that the frontage of their room was littered with cigarette stubs and broken plates. “I told them to pack the dirt, but the woman started shouting on me; I did not understand because she was speaking in their language. “I later went downstairs to call the manager. When she got there, she tried to calm them, but they did not listen to her. The attendant said as Feng was stepping out, someone raised the alarm about fire, adding that he discovered that the fire started from the suspects’ room. He said he alerted the hotel manager to the incident. Zhen, who spoke through an interpreter, denied the allegation, saying the fire started from a television in the room. “I did not set the hotel on fire. The fire started from the television in the room. I did not tell the room attendant that he (Feng) starved me for two days; he is lying. We always bought food from a restaurant,” she said. When the magistrate, Mrs. Bola Folarin-Williams, asked why she did not call attention to the fire, she said she could not because she did not know how to communicate with people in the hotel. However, the representative of the Chinese embassy, Olayiwola, said the embassy wanted the law to take its course. The magistrate said the argument of the defendants on how the fire started was unconvincing. She, however, asked all the parties to meet and agree on settlement terms, just as the hotel insisted on recovering its loss which it estimated at over N17m. The defendants were ordered to be remanded in prison until they perfected their bail conditions. The case was adjourned till August 9, 2016. This story is very amusing. So because of that, she want to burn a whole hotel? Na so we hear am o. Wicked world indeed.